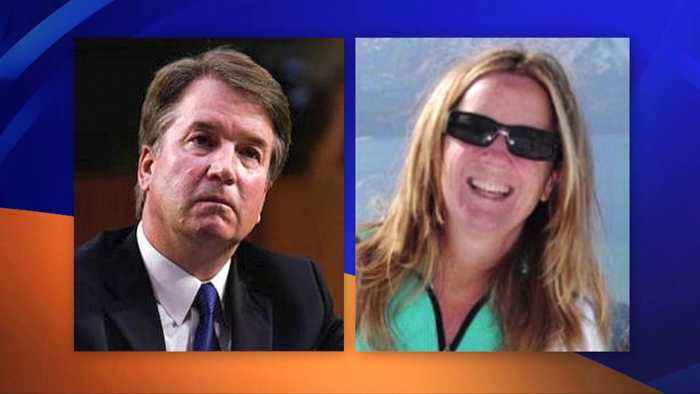 Christine Blasey Ford Lawyers Say She is Open to Testifying Before Congress, But Not Monday … And as Long as she Goes After Supreme Court nominee Brett Kavanaugh, HUH? WTF … FOLKS, WE ARE A NATION OF LAWS THAT ACTUALLY CALLS FOR A PRESUMPTION OF INNOCENTS AND A RIGHT FOR ONE TO CONFRONT YOUR ACCUSER. Christine Blasey Ford lawyers know say she will testify before Congress, but with conditions. They stated that she will not testify on Monday, The right to confront your accuser is one of the basic tenants of law in the United States, as well as the presumption of innocent. But not when it comes of all things to decide on the selection of a Supreme Court Justice. Does anyone see a problem with that? Democrat already know that Kavanaugh is guilty before they have ever heard from the accuser or the accused. Seriously! So lets understand this, Christine Blasey Ford is accusing Brett Kavanaugh of forcing himself on her at 1982 party somewhere in Montgomery County, MD and Democrats know she is telling the truth merely on the accusation. However, Christine Blasey Ford cannot say for sure when the 36 year old assault was committed, she cannot say where the assault was committed and she has admitted she was 15 years old and drinking alcohol. Christine Blasey Ford opened the possibility she would testify before Congress about her accusation of sexual assault against Supreme Court nominee Brett Kavanaugh. The message came a day ahead of a 10 a.m. Friday deadline set by Senate Judiciary Chairman Chuck Grassley for Ford to decide whether she would appear before a hearing he set for Monday. Testifying Monday, however, “is not possible and the Committee’s insistence that it occur then is arbitrary in any event,” Ford’s lawyers wrote. Here are the conditions that Ford’s attorney put forward in order for her to testify. Ford’s lawyers outlined these demands, according to a source close to the process. So the individual who so wanted to testify and accuse Kavanaugh now has demands. Why would that be? The one that should stand out more than anything is the one highlighted in red. In what world do these people live in because it is obviously not America. The accuser does not go second, they go first. I mean seriously, in America under the United States Law an individual has the right to confront their accuser. How in the hell would Supreme Court nominee Brett Kavanaugh know what the f*ck he is supposed to respond to if Christine Blasey Ford did not go first and make put forth her accusations. But this just shows the disingenuous of the negotiations. Ford and Kavanaugh allotted the same amount of time to talk. As reported at CNN, Christine Blasey Ford, the woman who accused Supreme Court nominee Brett Kavanaugh of sexual assault, she will not testify on Monday. She states there must be a FBI investigation first. HUH? So the woman who 35 years later makes a sexual assault allegation and cannot tell anyone for sure where or when it took place now demands an FBI investigation? Just what are they supposed to investigate? This is what the politicization and weaponizing of the #MeToo movement looks like. An individual who makes such an accusation after all these years, after all the statutes of limitations have run out, sorry, you need to defend your accusations. You are being provided an opportunity to tell your story and now you are saying no. The letter from Ford’s lawyers notes that despite receiving a “stunning amount of support from her community,” Ford has also “been the target of vicious harassment and even death threats” and has been forced to leave her home. “We would welcome the opportunity to talk with you and Ranking Member Feinstein to discuss reasonable steps as to how Dr. Ford can cooperate while also taking care of her own health and security,” the letter from Ford’s lawyers said. The accuser was given an opportunity to be heard, now she wants to delay this and turn it to even more of a circus. Sorry if this looks like a total polical hit job and an orchestrated Democrat ploy to delay the Kavanaugh vote. This delay of producing this letter was purposeful. As reported at the National Review, Senator Dianne Feinstein (CA-D) told reporters on Capitol Hill when asked if she believed Christine Blasey Ford’s allegation, “[Ford] is a woman that has been, I think, profoundly impacted. On this . . . I can’t say that everything is truthful. I don’t know.” WHAT!?! This coming from the Senator that has started this chaos at the 11th hour? Read the many reactions to Feinstein’s comments on Twitchy. I can’t say that everything is truthful. I don’t know. Feinstein, the ranking Democrat on the Judiciary Committee, has been maligned by her Republican colleagues for failing to disclose the sexual-harassment accusation after initially being made aware of it via a letter from Ford in July. Asked why she did not make her Judiciary Committee colleagues aware of the allegation at the beginning of Kavanaugh’s vetting process, Feinstein hesitated before citing Ford’s desire to remain anonymous. Just curious, would it be okay to say that you are voting for an individual because they were a man? And that being their only qualification? Face it America, Hillary Clinton after all her years in the public eye, after all her years in government as a US Senator and Secretary of State has accomplished nothing of accomplishment. In fact, the things she has done, like the Russian reset, Benghazi-gate and her private email server scandal have probably been more of a detriment than help. Is America really going to vote an unqualified individual who cannot seem to tell the truth President of the United States just because she is a woman? Just how ignorant and foolish has this country become? When you think about the social experiment of voting in the first woman as president, just because she is a woman ask yourself … how did that social experiment work of voting for Barack Obama, the first black one? Enough said. It seems many students at the University of Washington can’t think of any reason why they should vote for Hillary Clinton in 2016 — other than her gender. Campus Reform headed to Seattle, Wash., and asked several college students if they were “ready for Hillary” and why they would vote for her. “She’s a woman, and that’s literally all,” one female student told Campus Reform. “Because it’s time we have a female president,” another woman said.